In the run-up to the release of the new Dante's Inferno game, even before the marketing campaign hit high-gear, I noticed that the pop culture medieval flavor of the month had moved from Beowulf to Dante's Inferno. The culmination of this phenomenon occured earlier this week, when a student showed me his 19th-century edition of The Inferno, and within three minutes of that I ran into two other non-English majors reading Dante for fun. Of course, in the case of the two non-English majors, each was inspired by the game; one said, "my friends said I'd enjoy it more if I read the book first," and the other had already played the game and said, "the book is really different." For more on the differences and the ubiquity of Beatrice's breasts, see Got Medieval's review of the game. I mean, how can I resist diving into Hell after Beatrice (and her breasts) to battle demons? Beware! If your colleague plays D&D, and even acts that crap out*, she'll probably open fire at a faculty meeting. Me, I have a shield in my office and a chainmail bowtie, so I'd no doubt survive, except in the unlikely event that she would roll a natural 20. Really, now. I could understand if she had pulled a blade, or if she were addicted to Call of Duty or some game with a gun, this might, might be relevant. Good job, Boston Herald. * I'm assuming the "acted that crap out" means she did LARPs, or Live Action Role-Playing. Friend of the Wordhoard K.A. Laity has a piece about Chaucer and Valentine's Day. As I complained in the comments of a previous post, aside from things like joining Facebook groups and online petitions, there's little pressure those of us can bring to bear outside the UK to save paleography at King's College London. One thing we can do, however, is create a visual image. If enough of us make images like this, it just might have an effect. 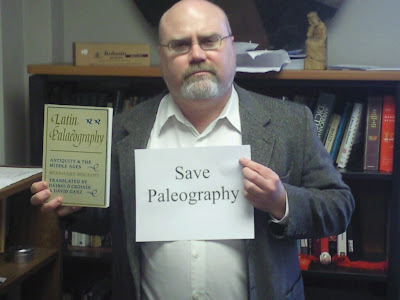 There's a petition to save paleography at King's College London here. I'm going to sign it, but I would especially urge us to encourage our colleagues in the UK to sign it. I suspect their voices will get more attention than mine. Please stop re-marking all my read posts as "unread" so that I have hundreds and hundreds of old posts to wade through every day, making it impossible for me to keep up on the news. Weeks of dealing with this stupidity has left me out of all the latest happenings. For example, I just found out today about the threat to the King's College London Paleography Chair, something the rest of the medievalist world has apparently known about for a while. In fact, I just joined the "Save the King's London Paleography Chair" Facebook group about two minutes ago. I love you Google Reader, but sometimes I don't know if you requite my feelings. Word has gone out that Bruce Mitchell has passed away. I have no further information at this time, but I believe he was in his 90s.